Rhonda Dudek's recycled sterling silver birds perch on collarbones to keep your flock close. The nest best thing to nuzzling with your brood, this sweet and symbolic Parent Nestling Necklace keeps family unity on a string. 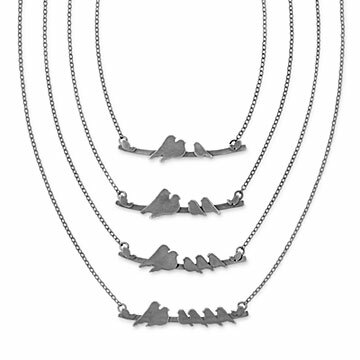 Symbolic silhouettes of lovebirds and their baby birds perch on collarbones to celebrate your clan with subtlety and style. Handmade of oxidized, recycled sterling silver by artists Rhonda Dudek. Features a wide branch and sturdy leaf connectors between the pendant and chain. Choose from 1, 2, 3 or 4 baby birds. Handmade in Rhode Island. Necklaces are made of oxidized silver and may appear darker than pictured. Rhonda Dudek designs jewelry as she travels around the country, while her sister Jess runs their Rhode Island studio. Together, they create adorable yet sophisticated sterling jewelry gifts for every stage of life. Each piece is forged, sewn, or soldered by hand and the simple beauty found in forests, both imaginary and real, inspires much of the work. Rhonda graduated from the Rhode Island School of Design with a BFA in jewelry and metalsmithing and built her collection while living in the mountains of Asheville, North Carolina. Rhonda's sister Jess manages the studio with her kiddos who love to help do the little tasks. They're a big part of the studio atmosphere, keeping everyone smiling, happy, inspired, and thankful. Take a Studio Tour to see where Rhonda designs her nature-inspired creations! No maintenance required. Do not use polish cloth, it will remove the patina finish. Bought it for a close friend is a great mother and dedicated wife. Expecting her second, this was a nice way to reflect the growing family. The two year old also loved it asking which baby bird represented him. I n the catalog picture it was shinier, looked more like silver. We were disappointed in the finish. The thought did come through though. My daughter-in-law is most of all very proud of her family, but also likes to look stylish. This necklace fulfills both categories. The necklace I ordered had 2 adult birds and 3 baby birds so the whole family is included. A unique gift to give to someone special. Very disappointed in the finish. The photo does not accurately represent how dull and dark it is. It may be recycled silver, but it actually looks like gunmetal, has no shine and looks cheap. Love the concept, hate the realization. arrived in a timely fasion. This necklace is my third order. We neded to upgrade with more little birdies and each one is so meaningful!